Click black buttons below to be directed to detailed information. Not be in prison/jail serving time for a conviction of a felony. Register to vote online with your driver's license or Illinois state ID card, last four digits of your Social Security number, date of birth, and the date your license or state ID card was issued. Download and print the Illinois state voter registration form. Obtain a voter registration form from the Board of Elections Office or download it here. Regular registration is open year round except during the 27-day period just prior to an election and during the 2-day period after each election (1 day after in Chicago). Grace period registration is an extension of the regular registration deadline from the 27th day prior to an election through Election Day. 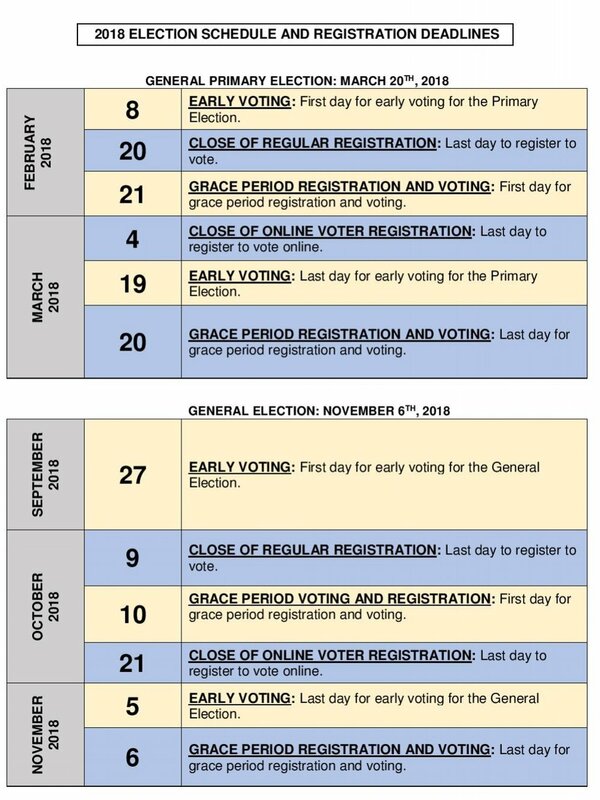 Grace period registration is only available “in-person” at sites authorized by each election authority. Use this downloadable mail-in form. Fill in the blanks, print it, sign it and deliver it or mail it. Deadline: 11:59 pm, Tue., Feb. 20. Register at Early Voting from Feb. 8 through March 19.